Baywater Farms’ spring mix is a custom blend of five flavorful lettuce varieties and one of our claims to fame. This delicious mix of hydroponically grown lettuces is designed to be unique, tender, colorful, and like no other spring mix you have tasted before, making it a perfect fit for restaurants and home chefs alike. All of our hydroponics, grown using sustainable farming methods, are available throughout the year. 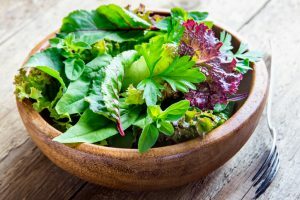 We offer our spring mix by the bunch and are the preferred hydroponic lettuce company of countless restaurants and produce distributors throughout the Eastern Shore. Instead of using filler lettuces and tough leaves, we use only the most delicate and tender lettuces for our blend. Our custom blended spring mix is the ideal base for a salad full of ripe heirloom beefsteak tomatoes and bright watermelon radishes, grilled meats, fruits, or vegetables. Baywater Farms’ spring mix is also the perfect topper for pizzas and flatbreads for a healthy flavorful boost. Just like our Bibb lettuce, we use a delicate touch when harvesting to avoid damage to the leaves. Once Baywater Farms spring mix is delivered to your restaurant or produce distribution company, it can be used immediately, stored, or washed and stored in paper towels to stay crisp. Baywater Farms is committed to high-quality hydroponic produce grown with care on our sixth-generation family farm. While the hydroponic farming methods we practice are modern, we still harvest and care for all of our lettuces by hand. Since our greenhouse is climate-controlled, our hydroponically-grown Bibb lettuces, spring mix, herbs, and microgreens are available every day of the year. Baywater Farms’ famous spring mix blend of five delectable lettuces is just as fresh and crisp in February as it is in June. Even better, all of our hydroponics are constantly being grown and harvested, so they can go from our farm to your table in hours, not weeks. You can find our fresh hydroponic spring mix, cultivated using sustainable growing methods, in restaurants, national grocery store chains, produce distribution companies, roadside farm stands, CSAs, and farmers’ markets. To learn more about our innovative cold-chain process and ordering our fresh local produce, click here. Our excellent hydroponic spring mix and lettuces speak for themselves, and we know your taste buds will love to listen!